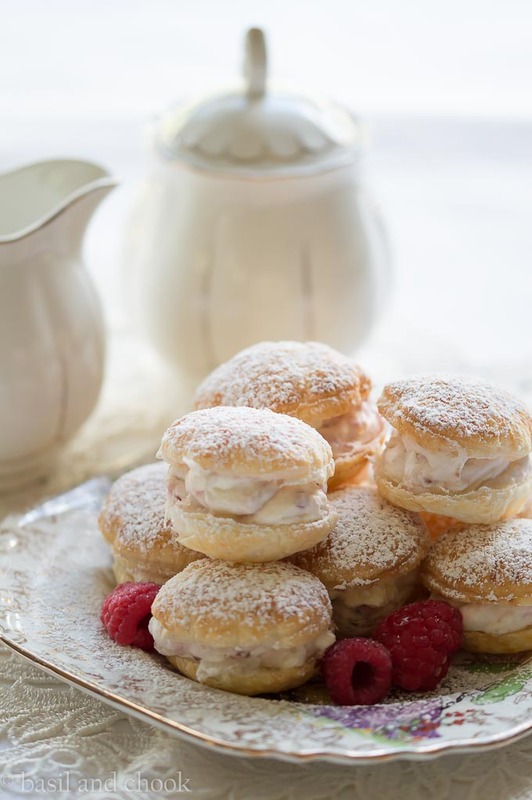 These gorgeous little Raspberry Cream Puffs are easy to make and are a perfect treat to make for Mothers Day. Pre-heat oven to 200°C / 190°C fan forced. Using a 2 inch cookie cutter, cut out as many circles as you can get from the pastry sheet. Place rounds on the lined baking sheet. In a small bowl, whisk egg and water together. Brush each circle with egg wash.
Bake circles until puffy and light brown - about 10-12 minutes. While the rounds are cooling, beat the whipping cream into stiff peaks. Fold in the raspberry jam. 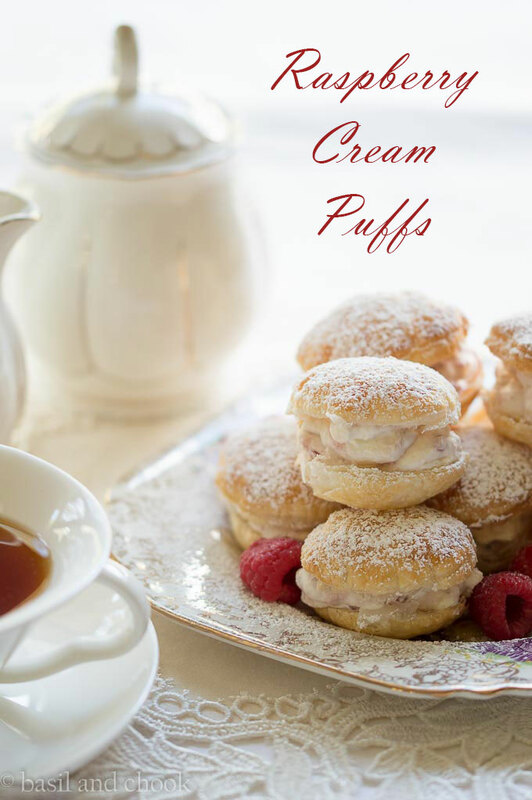 Using a knife, gently cut open the puffs, and fill with whipped cream. Top with other half of pastry. Dust with icing sugar and serve. Decorate with additional fresh raspberries if desired. In around half an hour, you have something delicious and light to serve with your afternoon tea. Let us not forget about that special person now and see if you have done your Mothers Day gift shopping yet? If you still haven’t thought of what to get your special someone then maybe they might like some beautiful teaware. I might just have got a little gift for myself, shhh don’t tell the kids. Can you see that beautiful teaware set in the picture? It’s a Sugar and Creamer Set from the Blush teaware range made by Maxwell & Williams. You can find this teaware set at the Matchbox stores or online at Matchbox.com. They also have a matching cup and saucer set. And the teacup in the picture might also be for me, it’s a Heart Cup and Saucer by Robert Gordon. I couldn’t resist it, as it is formed in a heart on the inside so when you pour your tea or coffee, it forms the shape of a heart. It is very pretty, and it makes you smile when you drink from it. You can find the pretty little cup and saucer here. Now back to these delicious little bites of sweetness. 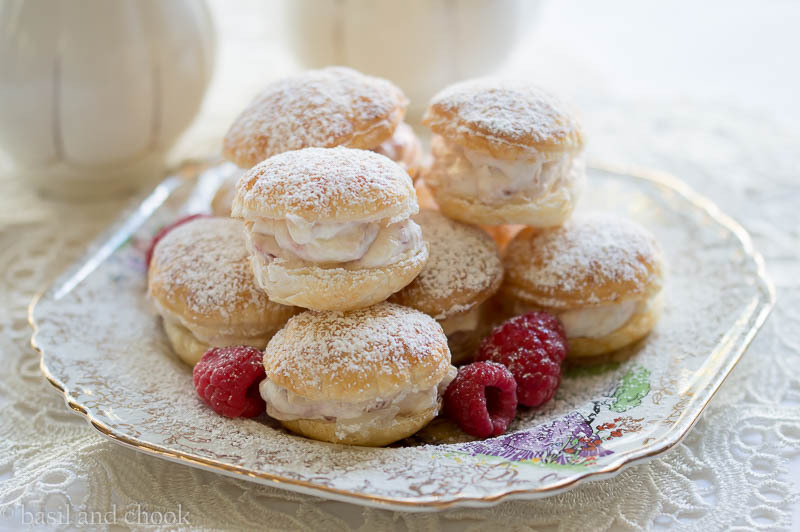 I stored the leftover Raspberry Cream Puffs on a plate in the fridge. I made these during the day, ate a few while taking photos of them, then put the rest in the fridge. The kids ate them for a treat after dinner, and the pastry was soft but not soggy. They are best to eat on the day of being made and don’t store them in the fridge for any more than a day. These would be perfect to serve with those Mothers Day gifts. 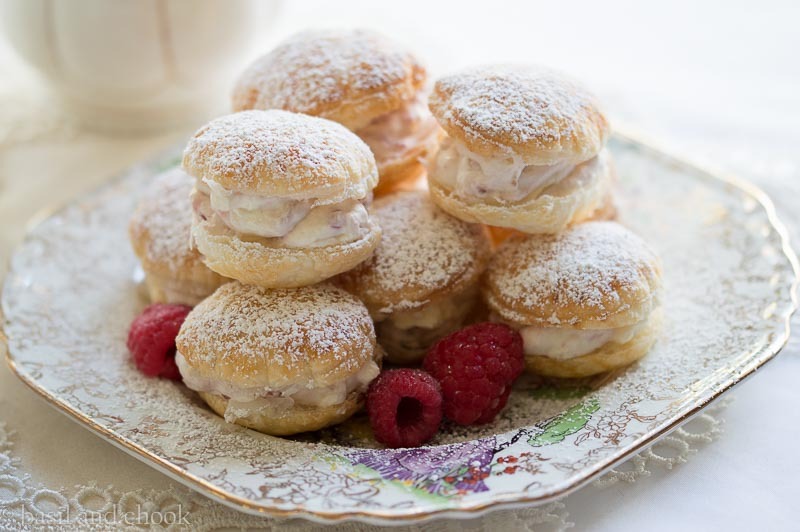 If my kids ask what I would like to have for afternoon tea, I am going to suggest these Raspberry Cream Puffs. I might just set up my special teaware on the table and drop hints. I wonder if that would work, hmmm? Have you dropped any hints to your family about Mothers Day gifts? Oh MY! 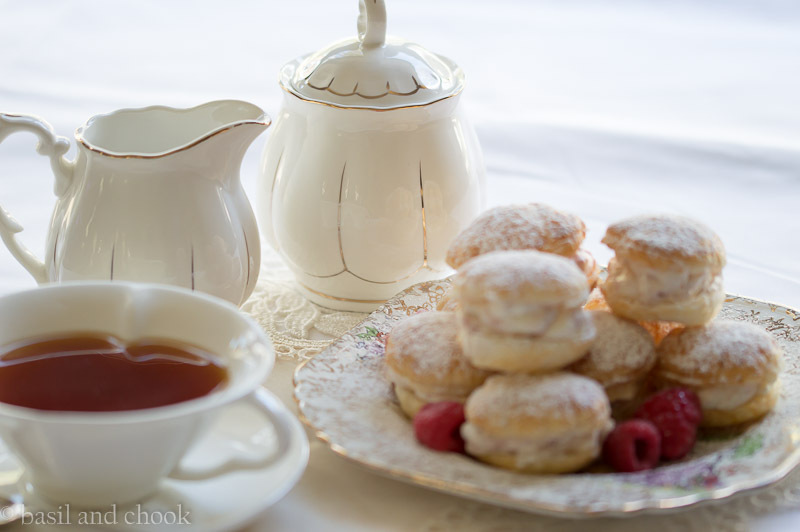 Such easy cream puffs and I LOVE your photos and crockery. I’ve added this to my ‘to bake’ list! Beautiful photography – very inviting. Nice post. These are adorable, I’m sure my girls would have heaps of fun making these ! Oh gosh, these are so beautiful and delicate! Love the pictures! Simone these cream puffs are just gorgeous! What a delightful idea for afternoon tea. I’m just loving your tea ware it’s so pretty, always makes for an even more enjoyable cup of tea and mouthful of cream puff! Wish I was eating one right now! Thanks for joining in with our Fabulous Foodie Fun. Oh Simone!!! What are you doing to me?? I’ve just had breakfast and now I neeeeeed these!!! Wow how gorgeous are these Simone! They would make the perfect afternoon tea for Mother’s Day! I will have to try them! Christine | Where The Smiles Have Been recently posted…Happy One-Year Blogiversary to WTSHB!